Shadow Warrior: Deadly Kiss was contracted in 1997 to Simply Silly Software, makers of Duke: Nuclear Winter, Duke!ZONE II, and Extreme Paintbrawl (the last one under the name Creative Carnage). Like the other two SW expansions, the publisher withdrew from the arrangement. Twin Dragon was released publicly shortly after this took place, and Wanton Destruction followed in 2005 following the recovery of the completed data by Sunstorm Interactive president Anthony Campiti. For a long time, the third addon was thought completed but lost. All that was ever known was a brief blurb on 3D Realms' website, and two screenshots. The project has gone through several phases of waiting, because it is first and foremost a recovery and restoration project, and "let's build a cool mod" project only in small doses as a last resort. Sitting here in my hands is the only (as far as I know) remaining copy of Deadly Kiss. I believe it's a dump one of the development drives directly after we shipped it off to WizardWorks. I wonder if it still works. Maybe tomorrow I can dig up a Shadow Warrior CD and see if it still plays. Once again I pose a question for you. I've been doing a little Shadow Warrior research of late and have gotten - though not tried - the two unreleased expansions. I noticed you were trying to get the third one and was wondering how far you got with trying to obtain it? Simply because I would love to get a hold of it as well and if you didn't get further I'll go ahead and try and have a go at getting a hold of it for the community. I gave Joe's contact information to Nacho, and soon enough, Joe sent us the data dump. I was able to sort through the understandably disorganized backup without much trouble and assemble a working copy of the expansion. The maps made a complete episode, and there was new art for two enemies, the main character, and some assorted objects and textures, but that was the full extent of the data, leading me to believe that the data dump was not from the completed build, as it lacked, among other things, cinematics, voice acting, art for a new final boss, a story, dev team credits, and documentation of any kind. In addition, the maps (level data) lacked polish in areas with a handful of significant issues. At this point I recruited my longtime friend Jimmy to contribute his skills working with BUILD engine game art. We each played through the expansion, documenting issues of any size. However, since the data we had was noticeably incomplete, I proposed that we wait to polish the material we have in hope of contacting other team members to ask for any data they may have saved, and to see if Joe Wilcox had any other information about the expansion, such as a design document. Due to the legal impasse, the project sat largely dormant until 17 July 2011, when I was contacted by two individuals who had made contact with one of DK's original team members, Crista Forest. They provided me with data she had sent them. This package contained an older revision of the art data, but about 30 maps which differed from the ones contained in Joe's package, with file modification dates on both sides. To date, this is the only other data we have received. (The two individuals joined our team, but as time has passed with little progress, they gradually maintained less of a presence, though we still keep in contact.) Work soon after returned to a state of Jimmy and me sitting on our hands in the hopes of recovering newer and more developed data to use as a base. Time elapsed without any further contact occurring. Starting in July of 2013, I received a series of emails from another individual who had done extensive research through the Internet Archive's WayBack Machine and found information about some of the other mappers who had been involved in the project. Nacho set out to communicate with said mappers, but none seemed to remember much, as DK was a lowkey project. In addition, I asked him to get in contact with DK's 3D modeler to try to recover the cinematics, but unfortunately he passed away in 2001. At just about exactly the same time, Redux was released. Termit and Lunick contacted me about Deadly Kiss, and from what I know, Devolver contacted Nacho. Nacho replied, and Devolver gave the expansion's recovery a bit of publicity. My good friend and skilled mapper Daedolon joined the team soon afterward to focus on maps. At this point, the team had given up just about all hope of recovering any more data, after being met with negative responses from all the team members we could find. Eventually we began to consider that we actually had all the data there ever was. I took some more time pursuing a lead for an original design document, but I was unsuccessful. At this point decided we were done waiting. Most recently, Mike12 joined our team as an artist alongside Jimmy. The biggest "known known" of the project remaining is to polish the maps to production standards. Daedolon and I examined all the maps contained in both Joe Wilcox's and Crista Forest's data packages to find the most up-to-date versions of each. We have extensively documented the changes and fixes that need to be made. Some obvious small gaps in the sprite sheets we recovered have been filled in by Jimmy. Unfortunately, the data we recovered outright lacks the items listed above, and more, that would make it a complete product. Now that we've stopped waiting, we've begun considering our options. On one hand, cutting is shipping. It would be easy to release the episode as a simple map pack. On the other, a significant effort lies in front of us if we want to live up to the quality of Sunstorm's addons, the refinement of Twin Dragon, and the thematic energy of Nuclear Winter. We prefer the latter. At this time, we are not looking for further help. I will post here if/when this changes. If you or someone you know worked on Deadly Kiss or has any more information to contribute, please do not hesitate to contact me. This is a good rundown of the story. Btw Crista was a mapper/artist herself. She didn't do all the art obviously, but I believe she was responsible for those two new enemies herself. Her position as a mapper was what got me to contact her and her standing with level infinity. The sillysoft members switched positions at the time of deadly kiss quite a bit. I also was looking for Roger Tweedle and found out the same story about him passing away. Most of those people were involved with a scrapped Unreal addon called Steele Dawn as well, under Level Infinity and Crista's map was the only one that survived and that I was myself able to find, in that sense that particular chapter of LI remains even more dead as only textures and the map of Crista were found. Roger Tweedle also did the models on that one and only screenshots of his work exist. With Deadly Kiss I guess we can be glad so much was found, but it sure cant have been the wizardworks final copy. At some point even though you know there might have been or was some more content, you have to let go and just work on the project. I had to do the same with UPSX even though I know for sure there was more (the custom character/bosses models only on screenshot, the actual psx hrdware build, the remaining/uptodate maps by Eric Reuter and Jason and some unreal prerelase maps that were gonna be used/converted etc etc). I hope you can post some of the wayback machine links here too btw for historical purposes. EDIT: Just FYI I can't find the original conversation with Crista anymore for some tidbits. Delacroix might be the only person having it still and despite me contacting her first she chose to reply directly to him. I do vaguely remember it though and really I'd swear she revealed she was responsible for those two enemies herself. I also got in contact with Nick Parde (aka zarzoo) from LI at the time, but he had nothing left (of steele dawn) and said if anyone he would have got me in contact with Crista, but that was already done. I'm trying to regain contact with some other people currently and over the years I provided e-mail adresses to Hendricks to try whenever I found some lead. With Deadly Kiss I guess we can be glad so much was found, but it sure cant have been the wizardworks final copy. I believe it's more likely that 12 years makes the sequence of events fuzzy, especially since several of the team members we contacted only barely remembered working on the project at all. Most of those people were involved with a scrapped Unreal addon called Steele Dawn as well, under Level Infinity and Crista's map was the only one that survived and that I was myself able to find, in that sense that particular chapter of LI remains even more dead as only textures and the map of Crista were found. Roger Tweedle also did the models on that one and only screenshots of his work exist. It seems like there is a lot of overlap between the games I mentioned, plus Twin Dragon, and Duke mods Ages in Time, The Gate, and Secrets of The Acropolis. I do vaguely remember it though and really I'd swear she revealed she was responsible for those two enemies herself. Andre Lowe told me he remembered drawing the ninja ichiban. Yeah, it's always good to find out new stuff. I have no convo history or other data to offer on the subject. I apologize. What I managed to get is all I got. Fantastic post. There's so much exciting stuff happening in the community at the moment! Thanks for all the hard work you're putting in, Hendricks266 & co. I have serious reservations about the idea that Deadly Kiss was ever completed. The timestamps on everything lead me to believe it was canceled before it was finished. At this point, it would be good if the project got some coverage of some sort. I mean, it sounds like you've tried everything, but who knows how data or documents got shuffled around during all these years. It's possible that someone has something of interest in his attic, someone you'd never could have thought of, and the only possible connection would be if that person heard of the project by chance. I know it's slim but it's worth a try. At this point though I can't help but wonder if it's actually good. I mean "makers of Duke: Nuclear Winter, Duke!ZONE II, and Extreme Paintbrawl" + the two first screenshots show square areas with barely any shading, the third screenshot is better but it's still just another square area. I hope to be proven wrong. The Paintbrawl maps are actually good. Sorry I must have misremembered about Crista. It would help if I had those conversations again so it would refresh my memory. I have serious mind blocks. Either way she for sure did some of that level design as she had in progress work bits too apart from completed maps. And tbh the maps in DK apart from the first level, have higher quality than most of twin dragon's and are more expansive. Those officially released screenshots, they had the gamma turned up all high or something so of course it looks turd, the real maps dont look that bad. Anyway, I too hope to be proven wrong and wish you guys all the best restoring the add-on. I also very welcome the info. It seems that there are a lot of projects going on (Deadly Kiss, Total Meltdown, support for SW under eduke32, support for WT, ...) so it's nice to have an overview for this project. Did the original dev team even get the ADR for the main char or do you guys have to do so the ADR yourself? Automated Dialogue Replacement. It's a studio term used to describe rerecording dialogue for scenes shot on location for more control and better quality. Or in this case, just dialogue recording for games. But that's where it originated. We have no data for sounds or voice acting at all. We have started writing a new script. The term is used incorrectly in reference to games because there is nothing to rerecord. There was certainly voice acting in games back then and I think that's what he's talking about. ADR is not the proper term in any game's case really. Unless maybe a scene was shot for motion capture and the actors have dialogue during those scenes that they'd have to rerecord in a booth for the same reason. That's the only thing I can think of. ADR is specifically for recording new dialogue and matching it to an already shot scene as you're watching it to match the lip movements etc. It's also used to re-record for TV versions of films, to replace profanity (which doesn't always go to plan, leading to gems like Trinity saying "I'll tear that whole cockamamy building down" in one of the Matrix movies on AMC, with the word "cockamamy" coming from someone who CLEARLY wasn't Carrie-Anne Moss). Fun stuff. Haha! I never knew that! I really appreciate this team, who also worked on Secrets of the Acropolis, The Gate and Twin Dragon. While the maps are uneven in quality (Ryan Isenberg and Aaron Barber seem to me the best craftsmen in the group), all of them have a great atmosphere that haven't been seen in other mods. I can't wait for this restoration. Everyone else described the term perfectly. The last game studio I worked at got bought out by a major movie studio, and the current studio I'm at is on a movie studio lot. At both studios everyone referred to character audio as ADR. The term is used incorrectly in reference to games because there is nothing to rerecord. The game industry always likes to hi-jack terms and use them incorrectly , but you are correct. I look forward to playing what you guys come up with! The publisher is indeed Sillysoft, but the map designers are the people from SOTA, so it won't be that bad. Hendricks: Were those two 3dr screenshots staged? The stats for the first image says there were no monsters. Were ninja sprites just placed around for screenshot purposes? I would think so, given what you've mentioned and how all the enemies are facing the screen. I would myself love to get touch with Ryan Isenberg. I saw screenshots of his Steele Dawn levels too and they looked great. He never responded to me, not sure if anyone else had the same luck with him. Either way yea it was different team than Nuclear Winter for example with just some people being in common. I did enjoy NW myself I guess as one of few people, but some of the levels were quite unfinished/bland and I noticed one of them (the "backdoor" level) has taken obvious inspirations from at the time Unreal prerelease screenshots, in which one room is like the exact replica of what was going on there. (The pipe room with the water and those ducts that are awkard to climb). I wonder if any of those guys played the actual prototype with the map (I haven't). It really stroke me rather odd though in an addon that's christmas themed and suddenly you get unreal screenshot ripoff that was in the Mine texture set. Marphy Black mentioned to me that archive.org recently changed its policy so that domain parking services with robots.txt files blocking their crawler no longer inhibit viewing of older snapshots from prior owners. I'm reviewing old lists of links and I've found some new leads for contacting team members that I am now pursuing. EDIT: LOL all these email addresses are bouncing. This started when I came across a post from Hendricks asking for any information relating to the people who worked on Deadly Kiss. I had remembered reading about a mapper ("MattCake" with the map being "Mine Fury") who had worked on DK and passed it along. It really wasn't much but better then nothing. I was surprised to hear back from Hendricks that no real credits had been kept for any of work on the addon let alone the maps so I decided to look into it further. Mattcake also said in the Mine Fury readme he was a member of Level infinity, the group that created Twin Dragon. Often times members of these groups worked together on different addons both commercial and free for various Build Engine games so their names come up a lot. 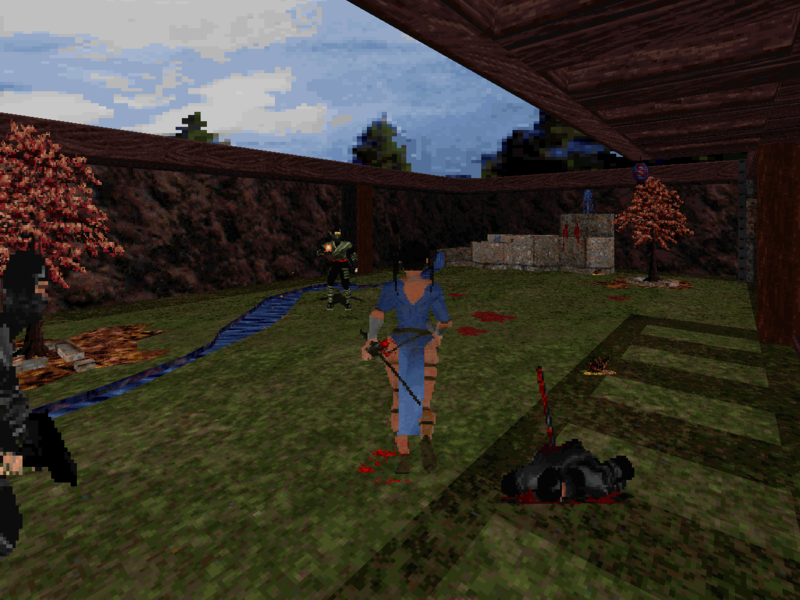 For example some even worked on all three Shadow Warrior addons despite all three being created by different teams. After going through the (2nd) old Level Infinity website I found their team had a work experience page where they listed the other projects they worked on. From there I finally had some other names to look into. It didn't take too long to find some old websites belonging to the individual Level Infinity members. Some of these pages elaborated their roles further (Such as Crista's) and others allowed us to put names to their specific work, such as Tempest's. Unfortunately this still didn't get us anywhere near every map credit. Some team members didn't have websites (or they weren't archived) Others I'm not even sure even had their work used in the end, like Jim "Ironman" Semkiw (Deadly Kiss has no Hospital map, but Twin Dragon did) And of course there were obviously more people not a part of Wanton Destruction or Twin Dragon who were involved. In fact one of the mappers just contacted Hendricks out of nowhere one day some time after all this was dug up and had he not come forward we likely never would have known he was involved in the creation of DK at all. Small Bonus: Two animated gifs I never see posted were revealed on Wang's Dojo back in 1997 alongside the two much more widely known about mockups. Well, you see the confirmation of Crista Forest as level designer. So she wasn't an artist on it after all otherwise it would say. My memory was hazy on it. It also mentions in one of these pages that Deadly Kiss was finished and I do believe that. It really was likely that it was, just what you guys got wasn't the entirely complete package and indeed crista's levels were more up to date. If you got everything Roger's work would have been in, too. But it really seems unlikely at this stage to recover more. In fact Joe Wilcox said he "thinks" what he got you was the ready product, but it wasn't. Perhaps he would have had more somewhere else or it's just lost. Yea the old adresses from wayback machine etc never work. It's just too much time has passed for them to work, the state of things were changing incredibly fast back then and then there was that huge "aol explosion" which killed so much in the end. At least from what I've heard. EDIT: At one point Hendricks mentioned there was the old story in one of these pages, where was it? Even if it wasn't used or if you guys don't want to use it, it's still valuable for historic reasons. Again, I think he was misremembering, or he meant that the maps were finished. SillySoft did have low standards. Nothing to add besides my endless respect and awe for this your dedication and hard work. Not just Joe said it was finished however I'm sure what he got you wasn't the final stuff, hell its kinda proven now that Crista had at least some more bits of work, though that didn't include the first level which was the only one in the pack you couldn't end by default. The only one. So in a sense yes most of the maps were finished and just needed some debugging. However given the state of the first map and it having originally no ending, plus the fact that roger has done modeeling work/sequences and they are missing, that's all enough proof it isn't all that was there.